Chelsea suffered a 2-0 defeat to Liverpool at Anfield on Sunday, dealing a big blow to their hopes of finishing in the top four in the Premier League. Second half goals from Sadio Mane and Mohamed Salah sealed the win for the home side, with Eden Hazard guilty of missing two big chances thereafter which could have brought them back into the encounter. However, it wasn’t to be for the Blues, who remain in fourth place for the time being, but Manchester United sit just two points behind and Arsenal have a three-point gap to cut with both sides having games in hand. 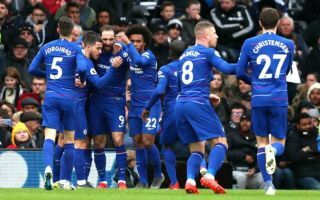 In turn, it’s a setback for Maurizio Sarri and his men, as they will now have to dust themselves down and go again while Liverpool’s huge win could be decisive in the title race. The Merseyside giants were the better side over the 90 minutes as they dominated for the most part in terms of possession and created plenty of chances. With that in mind, it’s no real surprise that Chelsea supporters were unimpressed after the game, but it appeared as though their rage was centred on two players in particular. Gonzalo Higuain struggled to make a positive impact after coming on in the latter stages, while Willian failed to have a decisive impact in the final third throughout the crunch clash. As seen in the tweets below, it’s fair to say that many Chelsea fans were not happy with their respective performances, and will hope to see Sarri avoid using them as much in the final handful of games between now and the end of the season. • I don’t want to see Higuaín in a Chelsea shirt again. • We need to sign proven (in prime) goal scorers we can’t really on Hazard.